enJOY it by Elise Blaha Cripe: this is my business story : part ten. this is my business story : part ten. One of the greatest mistakes that I have ever made was assuming that I could do it all at the same time. I planned to take a two month "maternity leave" when I had Ellerie. But what I didn't come up with was a plan for after the maternity leave ended. I somehow thought that I could actively raise a kid and actively grow a business without help. I'm not sure why I thought this. It's true, many people, all over the world, successfully do both by themselves. But many people, all over the world, also return to work and have childcare. In retrospect, I (and my family) would have benefited greatly if I had realized earlier that I was in the later group. I also kind of sucked at really taking a "maternity leave." I kept blogging on occasion while on break. I have mixed feelings on this. I'm so grateful that I got those thoughts into real words, but I also realize that while this blog is still personal and authentic to who I am, it is no longer just an outlet. It wasn't fair to me that I treated it like that. I put a lot of pressure on myself those early days of motherhood and boy, was I a mess. It wasn't until I started writing, editing and re-reading this business story that I realized what I went through my fall semester of college was very similar to my transition to motherhood. This description of how I handled the job application process? I was totally insane. Totally overwhelmed. Totally over-reacting. Totally panicked. It is word-for-word how I felt as a new mother. You don't need to be a detective (or play one in BlogLand) to see the reason. I am really bad at handling life when things feel like they are spinning out of my control. Waiting for someone else to give you a job is not great when you're super Type A. Bringing home a newborn and recovering from surgery while your husband is deployed is not great when you're super Type A (let's get real, none of those three things are great when you're Type A). Raising a kid and trying to run a business at the same time is not great when you're super Type A. Obviously, in both cases, I found my footing. I have grown the most (by far) in the years when my Type A personality was forced to take a few punches. But it took a tremendous amount of letting go, time and some honest conversations with (what felt like) everyone I knew to get to a point where I didn't sob at the drop of a hat. It took me months to recognize that I needed help. And then once we got some, it took even longer (almost a year) to realize that we still needed more. In the job hunt and the post-birth "balance" quest I had to recognize that what mattered was what I needed, not what anyone else thought was important. While I have no regrets about the path I took to finding a job, I would go back and change a few things about how I handled my transition to motherhood. I so wish I would have gone easier on all three of us those first few months. I wish I could have believed the people who told me it will all even out and be okay. I also wish I would have planned from the beginning that we'd get part-time childcare. 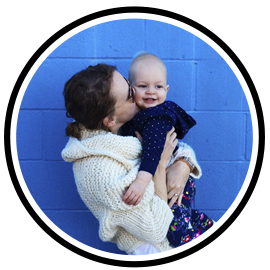 Before I went on maternity leave, my job was contributing substantial income and we always expected that I would keep working. It would have saved me so much guilt and stress and sadness if I known to do that I needed help. Today, Monday, October 27, things are good. My girl is in so many ways already my best friend and it's so true what they say, every single day (somehow!) gets better. I wrote out this whole saga because this experience was life-changing (obviously) but it was also another turning point in my career. I am a different business owner today (more decisive, more secure and more efficient) than I was before Ellerie. Having a baby rocked my world, but also made it a brighter and better place. It's also lit a creative fire like I will never be able to describe. I can't really figure it out, but I know a huge part of it is that I've become more comfortable with who I am and what I really want/need to be doing. This past year (2014), despite what felt like a crazy schedule and some growing pains, has been by far the most satisfying year for me creatively. to be continued...read part 11 here.